finished right in front of me. Like all good runners, the family decided to sign up for a Turkey Trot. Runners do this to themselves because (1) we're runners and we do things like this (2) Thursday morning runs are novel (3) the swag - a nice long sleeve t-shirt (4) any excuse to eat more excessively than we had already planned on. This year we did the Lifetime Turkey Day. We've been doing a tour of different turkey day races, and this one did not disappoint. Well, I was a little disappointed that Fleet Feet had only one location (not the one closest to my house) for packet pick up, but since I snagged a ride there from work, and I didn't wait too long in line, I'll forgive them. The night before the race, Mr. H. and I examined the course map, as you do, trying to make sense of it. Having both a 5k and an 8k makes the course outline strange sometimes. And the quality of course maps can be all over the place - I've seen hand-drawn maps before. This one was better than hand drawn, but still confusing, mainly because it looked like it had us running on Lake Shore Drive. Neither of us thought this was right and prepared for a general up the running path, hairpin turn, back down the running path course. Or so I thought. I've never done this race before, so had no idea they actually shut down two north bound lanes. It's definitely cool to run on Lake Shore Drive, a first for me, albeit a little hillier than the path what with those overpasses. or, in this case, in 57th place. 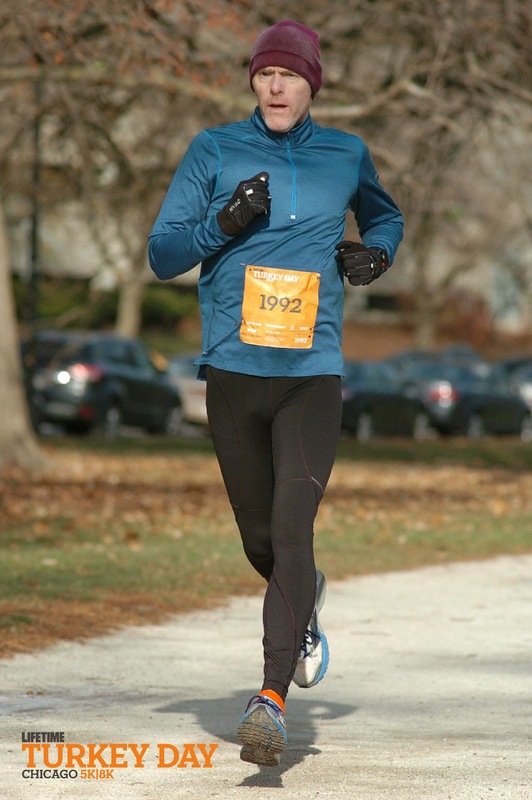 wasn't cold, so I had to take it off, which was difficult since my watch was in the way and I couldn't get my left arm out of the sleeve - mile 3, 10:23. But I made up for it in mile 4 ( 9:36) and mile 5 (9:08). Finishing time 49:58. Not my fastest 8k, but I'm not complaining. 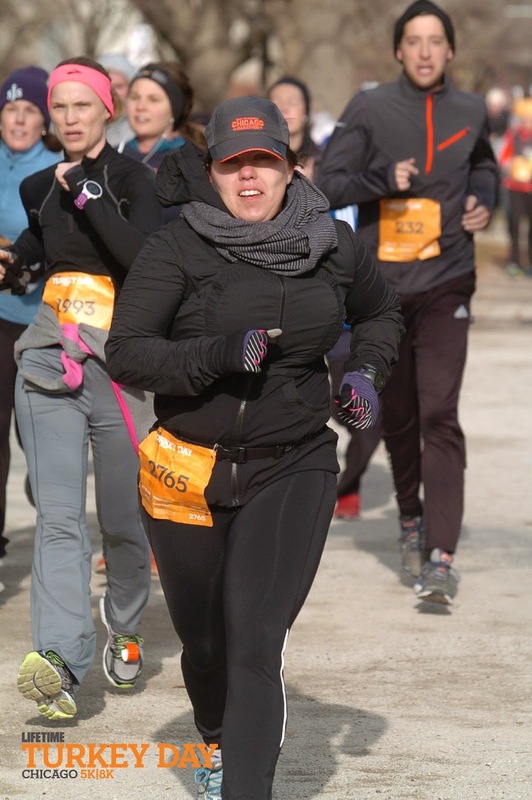 I know I benefited from the woman who was pacing with me (whose name I don't know because she wasn't in my training group, but I should know because we've been introduced and now I feel bad). I think having someone who is slightly faster than me to run with during races is really the key to getting myself to run faster. My general goal in races is to finish in top 50%. In my age group, which they did in 10 year increments, I finished 95th out of 211 - so all good there. Of women, I finished 599th out of 1,218 - so just squeaked in. Unfortunately, overall I placed 1,248 out of 2,167 runners. If only I hadn't worn that hoodie. (By contrast, Mr. H. finished 5th in his age group, was the 41st male to cross the finish line and the 57th person over all. I bask in his fastness). After our race, Baby H. was supposed to run a 50-yard dash, but due to (a) miscommunication (b) confusion on where the start line for the kid's races was and (c) miscommunication, he missed his race. I now feel like the worst mother ever, but hope to make up for it soon with a Christmas race (fingers crossed). Overall, as usual, it was a fun way to start the day, get a quick 5ish-mile run in and then go home and cook and watch football (which being in Chicago is just sad) and eat lots with loved ones. I know this is kinda late, but Happy Thanksgiving!